Learn what makes most beautiful islands in the world truly spectacular. Spend five days sailing through the Galapagos on board a luxurious yacht, dropping anchor and visiting some of the greatest spots that this tropical paradise has to offer. Hear all about the impressive history of the Galapagos and learn about conservation efforts underway as you visit the Charles Darwin Research Station and the Interpretation Center on San Cristobal Island. Lounge on the white-sand beaches of Cerro Brujo and take in the spectacular views from atop Bartolome Island. Meet some of the world's most exotic wildlife up close, from white-tipped sharks to blue-footed boobies to sea lions, giant tortoises, and more. Stop wondering what makes the Galapagos Islands so special: Come and find out for yourself! Walk along Sullivan Bay and observe what happens when volcanic flows reach the beautiful shores! Enjoy a tropical safari for such diverse species as frigate birds, Galapagos penguins, land and marine iguanas, and many more! Swim, snorkel, or stretch out on the sands of the Galapagos' countless beaches! Departure from Quito or Guayaquil to Baltra Island (2 1/2-hour flight). Arriving in the Galapagos, passengers are picked up at the airport by our natural guides. Lunch at noon. Dry landing, hiking, educational visit to the Charles Darwin Station (giant tortoises, Opuntia cactus, etc.). Day 2 - Saturday: Explore the lava formations of Sullivan Bay and enjoy the views from Bartolome Island! Breakfast in the morning.This site is of great geological interest is located south-east of Santiago Island, landing it can be done both on the rocky shore (dry landing) or the white sandy beach (wet landing). The length of the trail is 1.5 km approximately. The area is covered by lava flows Pahohoe type (solidified lava in a wavy or accordion). It was very active in the past 25 years of the nineteenth century. The Sullivan lava was formed in 1897. Flow is very young geologically. The magma formed is flat, but the underground lava movement, rapid cooling and other eruptions led to the break in many places. Wet Landing, After lunch visit to the Pinnacle Rock beach for swimming and snorkeling. In the afternoon dry landing to reach the viewpoint of Bartolome. On this island, you can see interesting formations of lava and cinder cones. After a 30 to 40 minutes climbing, a wooden staircase leads to the top of the island where there are beautiful views of the nearby beaches. This island is one of the most visited and photographed because of Pinnacle Rock. Wet Landing, to Bartolomé. One of the Islands´ principal attractions is the “pinnacle rock”, Pinnacle Rock beach is ideal for swimming and snorkeling. In the afternoon afternoon we will dry land to reach the viewpoint of Bartolomé. In order to see it properly see the beauty of the Pinnacle Rock, we will make a medium level hike for around and hour. In this excursion you will learn from the volcanic landscape of the island and see different species such as: lava lizard or cacti, once we reach the top will have a magnificent view of the Pinnacle rock in contrast with the volcanic landscape blended with the turquoise waters of the surrounding beaches. Pinnacle Rock is one of the most visited and photographed areas on the Island. Day 3 - Sunday: Spend a day getting to know the wildlife on North Seymour Island and Mosquera Islet! Breakfast in the morning. Dry landing. On this island you can see bluefooted boobies, colonies of frigates, fork-tailed gulls, terns, sea lions, lava lizards and land iguanas. Palo Santo trees can also be observed. Wet Landing. The Islet is Located between the islands of Baltra and North Seymour. It is a reef of rocks and coral (the result of an uprising) and a great white sand beach.In most of its perimeter there is basis of lava rocks, as evidence of the wash uprising, except in the southwest side where the landing occurs. This island has one of the largest Populations of sea lions.You can also observe several species of shorebirds. There have been occasional reports at this site of Orcas (Orcinus orca). Day 4 - Monday: Enjoy the flora and fauna of South Plazas Island and unwind on the beach at Cerro Brujo! South Plazas is situated on the east coast of Santa Cruz island, it's formed from uplifted marine lavae and is one of the smallest island on the archipelago. Despite the islands size, there is a large concentration of wildlife.Breakfast in the morning. Dry landing. This island is full of life. There are colonies of sea lions and land iguanas. While you walk on the banks it is possible to see a great number of birds such as nesting tropic birds and fork-tailed seagulls, but most of all enjoying the beautiful view from the top the steep banks or strolling along the base of the cliff is an extremely pleasurable experience.The cliff is an excellent place to view swallow-tailed gulls,tropic bird,frigate birds,pelicans and at the eastern end of the island we can see bull sea lions congregate to rest. Wet Landing is a beautiful beach of white coral where you can swim and watch birds and sea lions, plus you can snorkel. Located on the north coast of the San Cristobal Island. In the vicinity of the beach you can see seabirds like blue-footed boobies, Nazca boobies, herons, frigate birds and shore birds. Day 5 - Tuesday: Farewell, Galapagos! Breakfast in the morning.Dry Landing. This site is educational information about the evolution of the Galapagos Islands and animal life in the islands. Transfer out to San Cristobal’s Airport. If you have any questions about prices, please feel free to submit a request online via the link above or to give us a call at 1-888-LUX RAIL (589-7245).This is a perfect extension tour for any Tren Crucero journeys. Unless specifically mentioned, any pre- or post-tour accommodations, transfers to and from hotels at the beginning and end of the tour, tour extensions, or airfare are not included in the price of your journey, but can be arranged for an additional fee. All Ecuadorian citizens participating in this excursion must pay an additional tax equivalent to 12% of their total tour price. i) 20% of the trip price if it is cancelled between 89 and 60 days before the departure. ii) 50% of the trip price, if it occurs from 59 to 30 days prior to the departure. iii) 100% of the trip price, if it occurs within 29 to 0 hours prior to the departure. 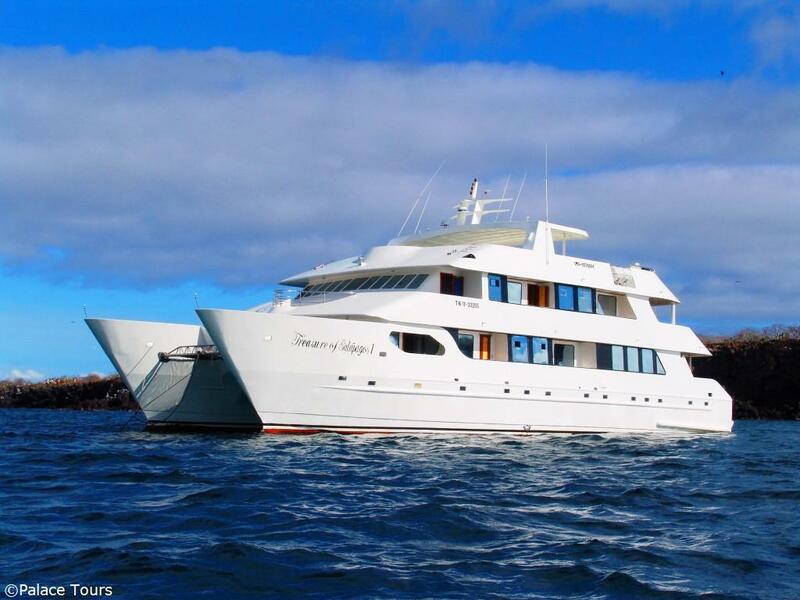 The Treasures of the Galapagos cruise vessel features nine cabins: One Ocean View Master Suite (36 square meters in size) and eight junior suite cabins (18 square meters in size). All cabins include a private bathroom, hot water, personalized air conditioning, a security box, and a two square meter balcony (The Ocean View Master Suite includes two balconies). The cruise vessel also includes several luxurious areas for socialization, including two bars, three solariums, a library with a TV/DVD area, a Jacuzzi, a lounge, and a dining room. Treasures of the Galapagos features a bilingual (English and Spanish) crew of eight members in addition to a level-III certified naturalist guide, who will join you on all off-board excursions as described in the itinerary. Ecuador uses 110 V electrical current. Guests whose devices do not run on 110 V current must supply their own international adapters. As per international law, you must have a visa in order to enter Ecuador to begin your trip. While Palace Tours does not provide visas, we can help by providing you with all the necessary information you need to successfully obtain a visa to Ecuador. Palace Tours strongly recommends the purchase of adequate travel insurance in your country of origin prior to arrival to cover injury, illness, death, loss of luggage or effects, or cancellation. Ecuador does not require a yellow fever vaccination, and the nation has no yellow fever or malaria alerts at any location at this time. Palace Tours strongly recommends you consult your physician for any personal health advice based on your travel itinerary. During off-board scheduled excursions, as described in the itinerary, you will enjoy the services of a bilingual (English and Spanish) level-III certified naturalist guide. Please feel free to ask the guide any questions you may have, discuss any concerns, etc. 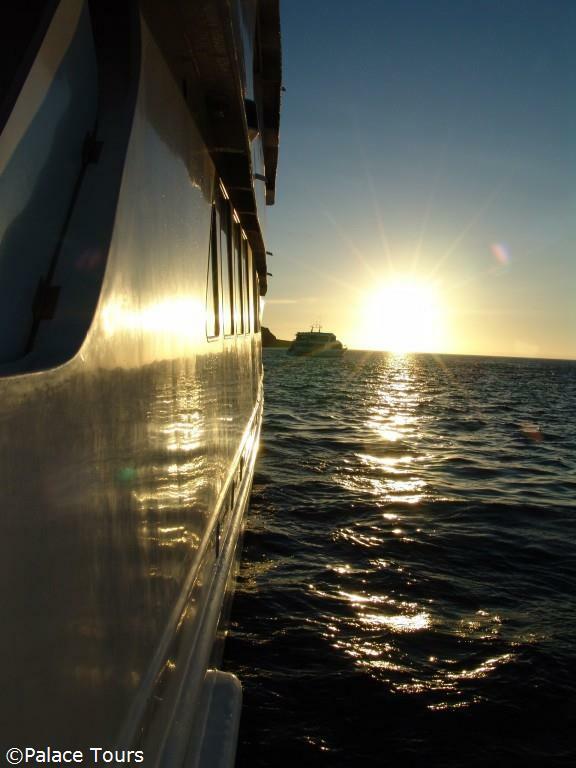 Guides are there to ensure you are safe and having the best possible Galapagos experience! Transfers to and from the cruise vessel during excursions take place with panga boats, and these landings can either by dry or wet and are indicated as such in the itinerary. Due to environmental regulations, docks are not available for landings or departures on any uninhabited islands you will visit as part of your tour. In the Galapagos Islands, the weather is relatively stable throughout the year. The cool, dry season lasts from July to December and brings overcast conditions and choppier waters. Temperatures range from 19° to 25° C, with an average sea temperature of 21° C.
The warm, wet season lasts from January to June and brings sunny skies and the occasional heavy rain shower. Temperatures range from 22° to 27° C, with an average sea temperature of 24° C (Though it has been known to dip lower). The Galapagos Islands are a perfect destination to visit at any time of year! In terms of clothing, we recommend comfortable walking shoes or boots with strong traction, "Teva" style sandals for hiking on beaches or wet landings, a bathing suit, a light-to-medium fleece jacket for cool or breezy evenings, shorts (Quick-dry, if possible), T-shirts, sunglasses (Preferably polarized), and a hat or cap. We also recommend you pack your travel documents, such as your passport, a camera (With batteries and plenty of film/memory), a basic first-aid kit (Band-Aids, aspirin, seasickness pills, stomach-settling pills), and cash (Preferably in U.S. dollars). You should also pack a backpack for any off-board excursions so that you can carry any essentials you will need for the day. This list is by no means exhaustive, but merely a suggestion to get you started. Please note that all transactions you make on board the cruise vessel, such as for an alcoholic beverage or a wetsuit rental, must be conducted in cash. The Galapagos Islands are on GMT-6 (The same as Chicago). They do not observe Daylight Savings' Time, so during the months of April-October, they are on GMT-7 (The same as Denver). They are one hour behind mainland Ecuador. Only two airports in the Galapagos Islands receive flights from mainland Ecuador: Baltra Airport on the island of Santa Cruz and San Cristobal Airport on the island of the same name. There is also a small airport on the island of Isabela in operation to receive the occasional small flight from Santa Cruz. The Galapagos Islands are serviced by LAN, TAME, and Aerogal (Now owned by Avianca). Guests on the Treasures of the Galapagos itinerary can expect several hours of gentle walking each day on paths which may be unpaved and at varying slopes, so guests should have a level of fitness appropriate to participate. Please ask any questions you may have related to fitness as an impediment to participation at the time of booking. Certain treks or activities, like snorkeling, may require a greater degree of fitness. Will I be able to use my cell phone or access the internet? Due to their isolated nature, cell phone and internet service will be limited on uninhabited islands. Can my children accompany me on Treasures of the Galapagos? Children under 12 years of age are allowed on board Treasures of the Galapagos excursions and pay 40% of the adult fare. Laundry service is not available on board Treasures of the Galapagos. Tips are not included in the total price of your journey and may be left as per the discretion of the guest.